Mason jar is a great rolling pin, especially when mine is at home! Good morning! I was so excited this weekend! Even though, it rained from Friday night until Saturday afternoon, while we were camping, I was very excited! I was able to try a new cast iron cooking method! Not even just a new recipe, a whole new cooking method! 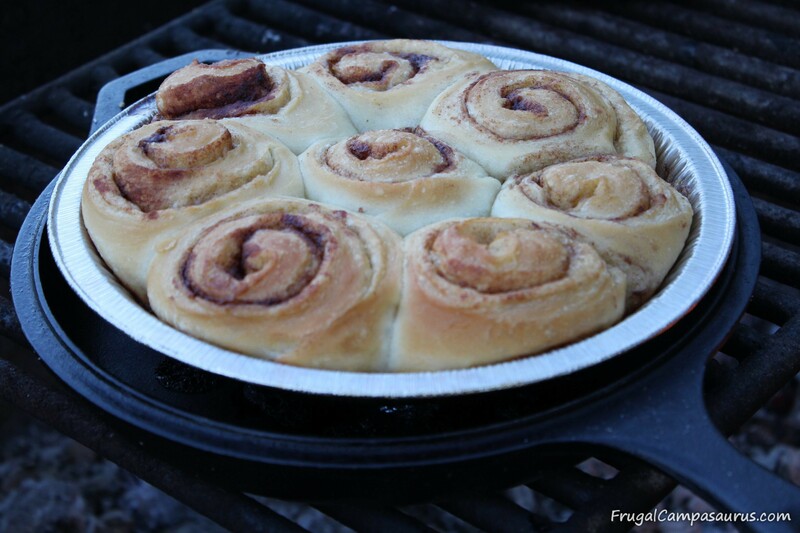 This weekend, I tried cooking with a pie tin inside a large Dutch oven to bake cinnamon rolls. 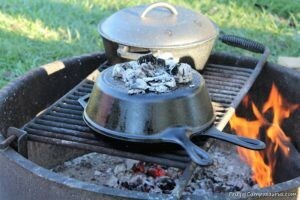 I have read about it and I’ve seen pictures online, but I’ve never tried using the Dutch oven this way. I never thought it would work very well, and I didn’t want to waste a pie tin, but I am sooo glad we tried it! Plenty of brown sugar and cinnamon! It was a great success! 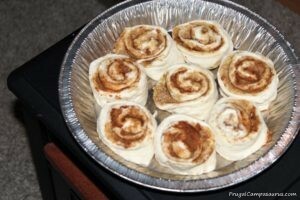 In fact, the cinnamon rolls were supposed to be eaten with my sibling’s chili that was also cooked over the fire. They didn’t make it that long: they were gone within 10 minutes! Thankfully, we also had cornbread to eat with the chili. 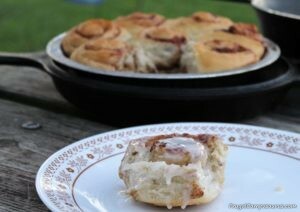 My original plan was to remake the cinnamon roll food flop that I did last year at Maquoketa State Park campground. It was a great end of summer vacation, just not a great breakfast. I have successfully made overnight cinnamon rolls at home, but on the Maquoketa trip, the cinnamon rolls stayed in the refrigerator an extra few days before baking. Not my best idea. I also tried to use the camp oven on the old green Coleman stove. It’s fun to cook with, but I’m not used to it- so I burned the cinnamon rolls. 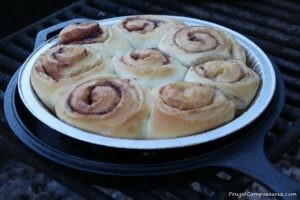 I wanted to try making the rolls again in the camp oven, but since it rained Friday and most of Saturday, I really wanted to cook over the campfire. 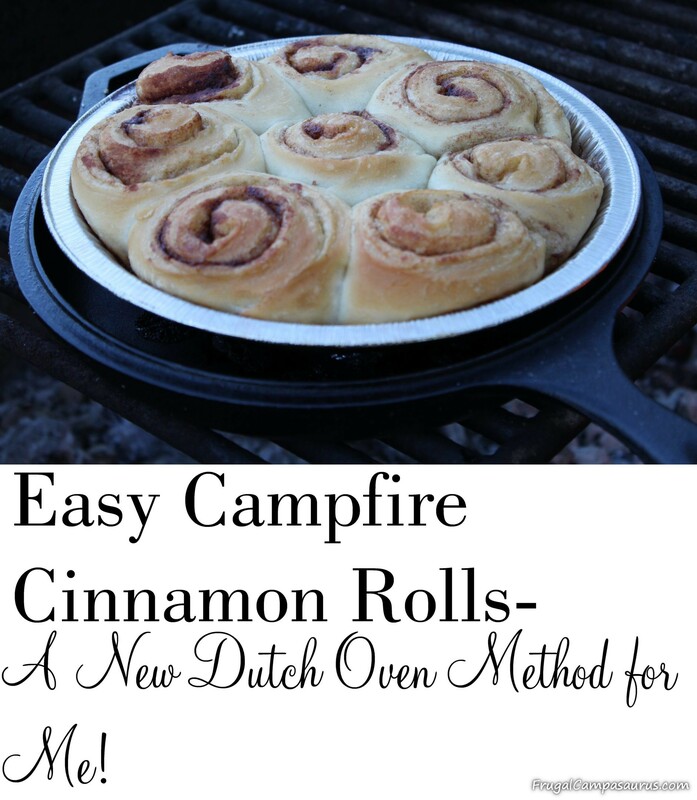 I decided to try the cinnamon rolls in a pie tin, inside the dutch oven! It was easy to bring Bucket of Bread along in the refrigerator on our camping trip. I also brought a mason jar of brown sugar and cinnamon mixed together. When I discovered that I forgot the rolling pin, I was very glad to have the mason jar. It worked fine to roll out the dough, so I won’t even worry about bringing a rolling pin from now on- I love less things to bring when camping! 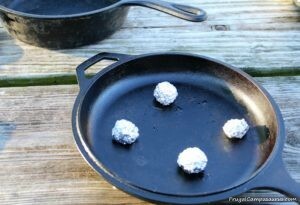 Aluminum foil marbles in the dutch oven-almost ready for cinnamon rolls! There are so few ingredients, that it is not really a recipe-which makes it perfect to take camping! I will outline how I make them though. Sprinkle some of extra flour over Bucket of Bread, sometimes it is sticky when you remove it. Take out 1/4 to 1/3 of the recipe, depending on how many rolls you want to make. 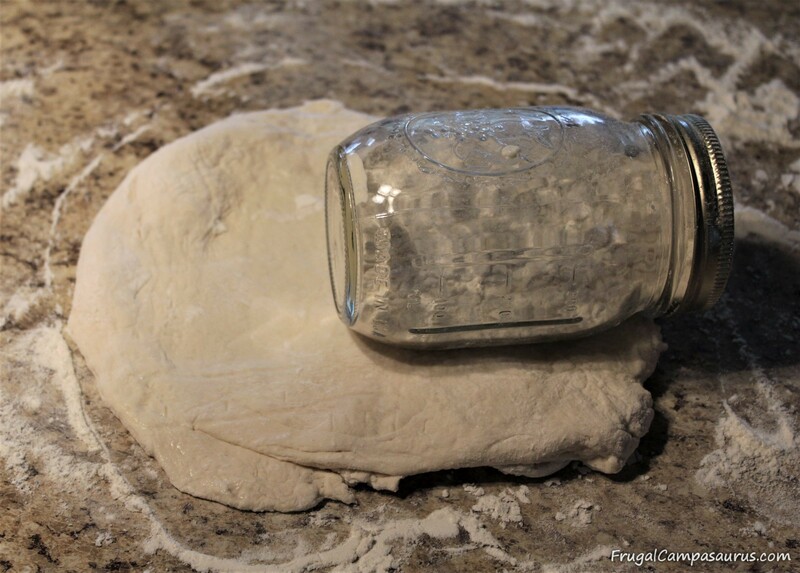 Flour counter and rolling pin (or mason jar), then roll out dough to a rectangle. 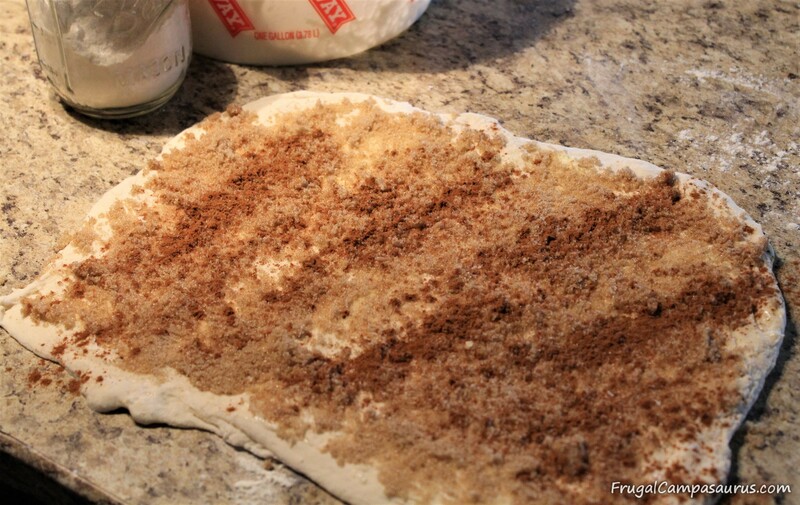 Spread dough with softened butter. Sprinkle on a heavy, even layer of brown sugar, then sprinkle on cinnamon. Roll up dough, and cut into 2-3 inch cinnamon rolls. Set into a buttered pie tin. Let rise until double, about 2 hours. Hopefully, you can find a warm, cozy place for the rolls to rise. 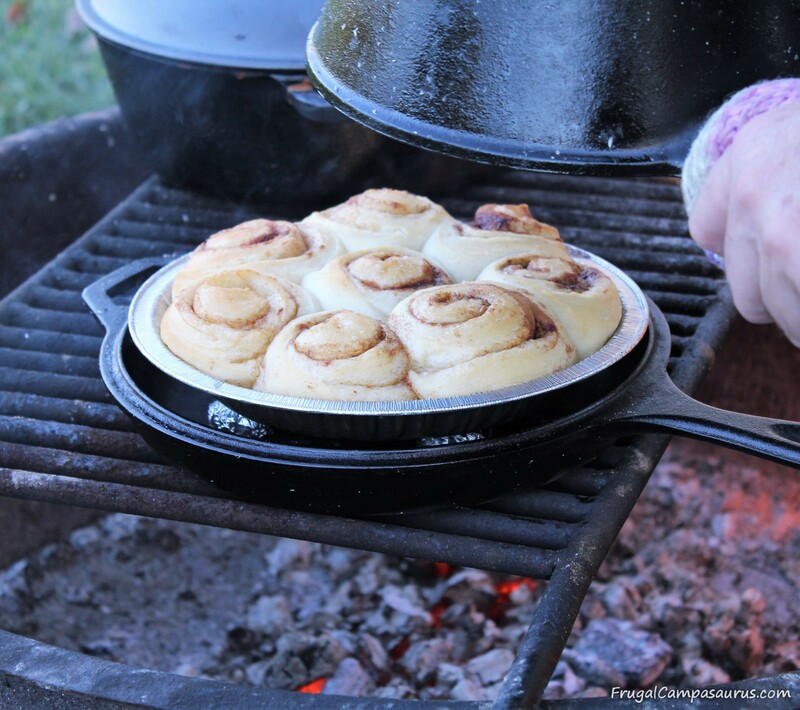 Cinnamon rolls and chili over the fire!! After making the cinnamon rolls, I tried to let them rise on the top of the electric heater. We use the electric heater instead of propane to save money when we camp. We already pay for the electricity with the camping fee, so we might as well save our propane. The heater warms the camper great, but for safety, the case is supposed to not be hot. This is not good for rising dough-the case was cold to the touch. The dough rose better on the counter in a patch of sunlight! Not quite done-but cooking nicely! 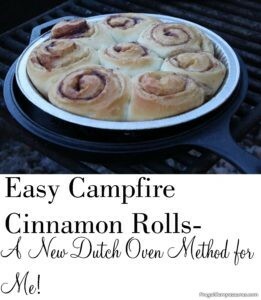 When it was time to cook the cinnamon rolls, we made 4 aluminum foil marbles to lift the pie tin off the bottom of the dutch oven. Unfortunately the pie tin did not fit down into my cast iron pan to rest on the marbles. Thankfully, the husband was helping: he inverted the whole thing. 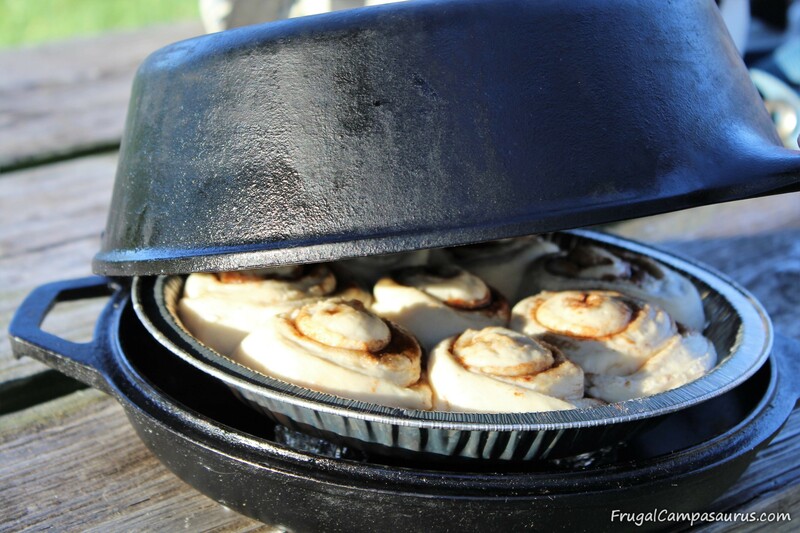 The pie tin fit nicely in the lid of the dutch oven and the deep pot made a nice dome over the cinnamon rolls. The pie tin was also still resting on the aluminum foil marbles to give it an air cushion from the heat. We set the whole pot over a nice fire with coals. We put a few coals on top of the dutch oven to help cook the top of the cinnamon rolls. After about 20-30 minutes, they looked amazing! They were cooked and not burnt at all! We added a bit of frosting and they were quickly eaten! They turned out sooo nice! And not even burnt! The only problem with the cooking method and recipe was my effort to be frugal. I tried to use a recycled pie tin. It had little pin holes in the bottom. I noticed them, but didn’t think they would be a problem. I was wrong. The holes let the brown sugar and cinnamon mixture seep through the pie tin as it cooked. Then, this sugary mixture dripped onto the hot dutch oven pan. My pan is covered in dime-sized, burnt sugary splotches-definitely hard to clean! I may need to use dish soap on it. Oh well, I’ll clean it, re-season it and it will be fine. So easy and yummy- they didn’t last long! Even though I didn’t intend to cook the cinnamon rolls this way, I am glad I did! They cooked so fast and turned out sooo good, that I can’t wait to try other baked items in the cast iron dutch oven. The aluminum foil marbles worked well. The cinnamon rolls weren’t burnt on the bottom, so I figure the cushion of air created by the marbles really helped. Someday, I will try the rolls in the camp oven again. It is fun to use, and it’s nice to have an option when I can’t cook over a fire. I’m sure if I practice and use it more often, the next cinnamon rolls won’t turn out like Maquoketa’s food flops! 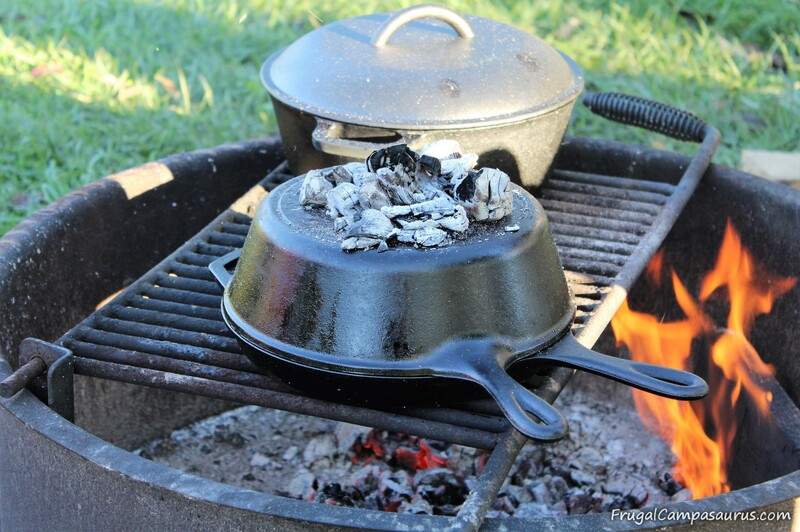 I hope you get a chance to try this dutch oven cooking method, I wish I had not waited so long to try it. Happy Camping (or cooking over the fire)!